On most boats, the mainsail is the biggest sail and therefore affects your upwind speed more than any other speed variable. It also has a lot to do with pointing ability. So if you are the person holding the mainsheet (whether you are the helmsperson or a dedicated mainsail trimmer), it’s important to do as good a job as possible. Like almost every other crew job, being a good mainsail trimmer requires practice and preparation to optimize performance. Here are some things you can and should do before the racing begins. Telltales Place bright-colored telltales on the aft end of the top two batten pockets. These will tell you when the airflow around the upper part of the sail is stalling. Battens Be sure the battens are inserted correctly and securely in their pockets. Use stiffer battens in heavy air and bendier, more tapered ones in light air (to avoid hard spots at their inboard ends). Sail controls Get familiar with all your sail controls including outhaul, vang, cunningham, backstay and traveler. Know where each one leads and how to adjust it. Set up all these control lines so they are untangled, out of the way and even on each side. Halyard Hoist the halyard so the head of the main is all the way up to the black band. After sailing for a while, check the halyard again for possible stretch or slippage. Flogging While sailing, try to minimize the amount of time your mainsail is luffing so you maintain the sail’s shape as long as possible. If you have a leech cord, set it just tight enough to eliminate flutter. 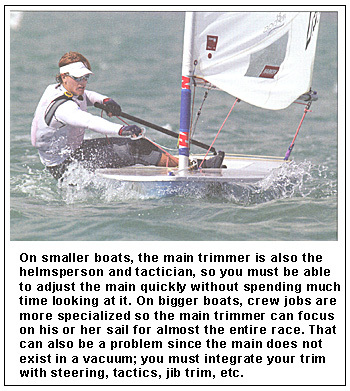 Rig tuning The main trimmer is often responsible for rig tuning as this has a large impact on mainsail shape. Make sure you have enough time before racing to check out the mast on both tacks and make any adjustments necessary. Cleats On small boats, adjust your main camcleat so the jaws are just below the sheet when you’re holding it from a hiked-out position. You want the cam low enough so the sheet won’t cleat automatically, but high enough so you can cleat it occasionally when you want. Tuning Before the race, spend time sailing upwind with another boat. Set up your mainsail trim, and when you are going fast, put a reference mark on the mainsheet. 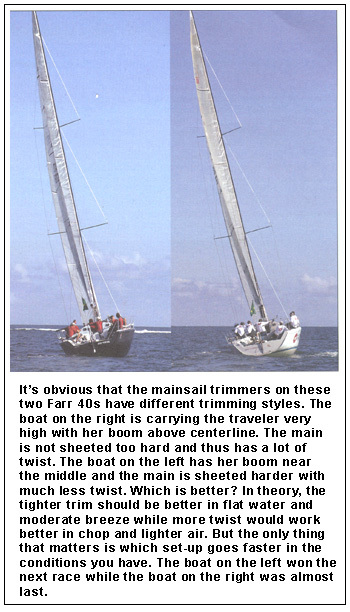 This is a quick guide for getting your mainsail trim in the ballpark while you are racing. Trimming the main may seem like a challenge, but if you follow a few guidelines, even an inexperienced trimmer can make this sail go fast. Hold it! Don’t cleat the sheet! The wind and waves are always changing and require constant adjustment of the sheet to keep the boat going fast. Plus, holding the mainsheet is one of the best ways to feel what the boat needs. Traveler Set the traveler car so when you trim the main (to the point where you have the right twist ), the boom is roughly on the boat’s centerline. This is a good all-around trim position. In light air, the traveler may have to be all the way to windward. In ideal pointing conditions, carry the boom above middle; when you’re overpowered, start dropping it to leeward. Top batten twist Another good rule of thumb is to trim your mainsheet so the upper batten is parallel to the boom. In light or lumpy conditions (or when you’re overpowered), ease the sheet so the top batten falls off slightly to leeward; in flat water and medium winds, trim the sheet harder so the batten actually angles to windward. Twirling telltale When you have the right amount of sheet tension, the telltale on the end of the top batten should be twirling (stalling) about half the time and streaming (flowing) the rest. This is a rough guideline that works for many boats most of the time. In ideal pointing conditions, you can trim the sheet harder so the top telltale is stalled almost all the time. Helm The trim of your mainsail has a large effect on windward helm and rudder angle. When you want less helm (usually in strong wind), make the main less powerful by easing the sheet, adding twist, making the sail flatter and so on. When you want more helm (e.g. for feel and lift in light air), do the opposite. Pointing The mainsail is your biggest tool in the pointing-speed tradeoff. When you want to go faster, drop the traveler to leeward and/or ease the sheet. When you would rather point higher, pull the traveler up and trim the sheet. In general, the tighter your leech, the more helm you will have and the higher you can point. But make sure you’re going fast first. Backstay Use your backstay to control the overall fullness of the mainsail. The harder you pull on the backstay, the flatter your sail will get. Just keep a few things in mind: 1) The backstay also has a huge effect on the jib, so make sure you coordinate any adjustments with the jib trimmer; 2) Every time you adjust the backstay, re-adjust the sheet and cunningham. Overbend? When it’s windy you may see ‘overbend wrinkles’ extending from the lower mainsail luff toward the clew. These indicate that the mast is bent so much that the sail’s shape is turning inside out. If you’re overpowered, it’s good to see a hint of these wrinkles so you know the sail is very flat. But if these wrinkles show up too soon or are too pronounced, take steps to reduce mast bend. Shift gears Use your mainsheet like a throttle. If the boat feels fast, trim the sheet harder and go for more height. If the boat feels slow, ease the sheet for acceleration, and bear off slightly. Keep changing mainsail trim to match the changing conditions. Look around Spend time looking at how other sailors trim their mainsails. It’s very helpful to get in a motorboat and look at other boats. It’s also a great idea for any trimmer to keep a camera handy and take photos of the main when the boat is fast (or slow). Communicate Perhaps the most important quality of all good sail trimmers is the effort they make to communicate with other people on the boat. The mainsail is just one part of a complex speed package, so making the boat go fast requires working closely with the skipper, jib trimmer and crew who warn you about wind and waves.